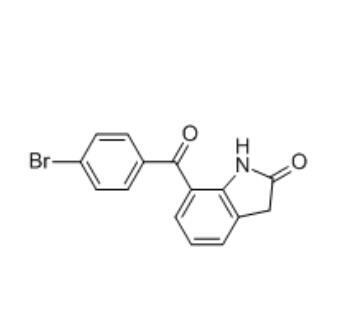 Bromfenac Sodium intermediate 3 of 7-(4-Bromobenzoyl)-1,3- dihydro-2H-indol-2-one CAS 91713-91-6, Molecular formula C15H10BrNO2, Molecular weight 316.15, It is a high-level intermediate of bromfenac sodium, it only needs to react with NaOH aqueous solution can get bromfenac sodium. The published synthesis method mainly in the following two. One is use the aromatic amine derivatives as the starting material, and cyclization reaction with methyl thioacetate under Pivaloyl chloride catalyzed synthesis of indolone, and then catalyzed can be get out bromfenac sodium intermediate 3 CAS 91713-91-6, the method of reaction steps is short, but the starting materials need to be prepared by multi-step synthesis, the process is more complex, the reaction conditions are very harsh. The other is based on p-bromobenzonitrile and indoline as raw materials, Use aluminum trichloride and boron trifluoride as catalyst for Fuke acylation, and then by oxidation and other steps to get the target product. This method is not only complicated, but also with low yield. There was a idea which is suitable for commercial production, use 4-acetamidobenzenesulfonic acid as raw material,then 4-acetamido-3- (cyanomethyl) benzenesulfonic acid was obtained under the catalysis of Lewis acid and then reacted with p-bromobenzoyl chloride under the Lewis acid catalysis to get 4-acetamido-3- (4-bromobenzoyl) -5- (cyanomethyl) benzenesulfonic acid, and then with the acidic aqueous solution to obtain the target product. The target product synthesized by this method has high purity and high yield, and it is easy to operate and is suitable for industrial production. Looking for ideal Bromfenac Sodium Intermediate 3 CAS 91713-91-6 Manufacturer & supplier ? We have a wide selection at great prices to help you get creative. All the 91713-91-6 are quality guaranteed. We are China Origin Factory of Intermediate of Bromfenac Sodium 91713-91-6. If you have any question, please feel free to contact us.